As you head eastwards, Norfolk falls away behind you. The landscape simplifies, as though the wind from the grey North Sea has scoured it of anything inessential. In late winter, with the fields ploughed and the caravan parks empty, it can seem a tabula rasa, an empty slate, cleansed and waiting. 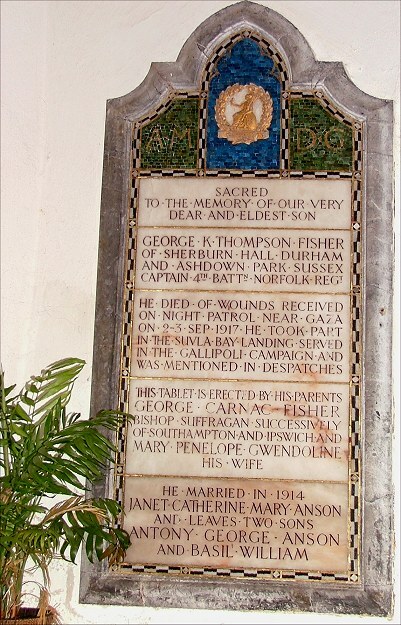 The village is called Fleggburgh, but the parish is Burgh St Margaret. It lies a few miles inland from the sprawling resorts of Yarmouth, Caister and Hemsby, but its fate is very much tied to theirs. The area's biggest employer is the leisure industry, and the east Norfolk towns and villages seem empty outside of high summer. And, just as the seaside towns rose to prominence in the late 19th century, so there was a knock-on effect in the hinterland. Outside of Norwich, this is the only part of Norfolk where the population was actually rising in the 1870s and 1880s, and this pretty church underwent a major renewal, an almost complete rebuilding, at the hands of Diocesan architect Herbert Green. 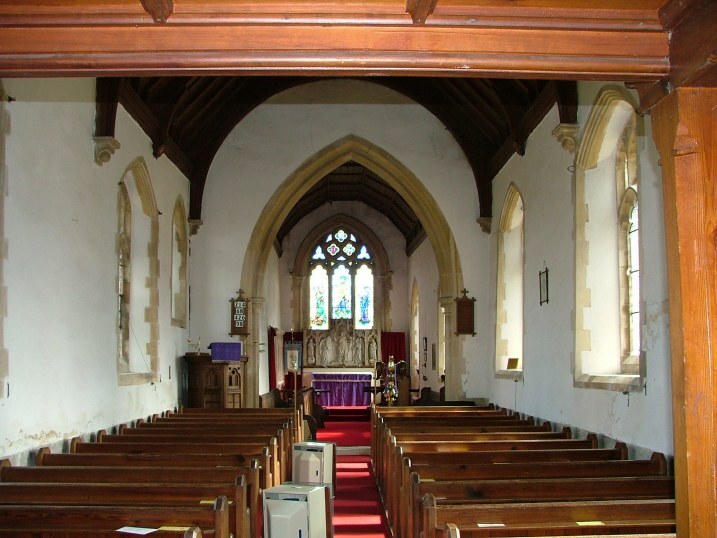 Along with his predecessor Richard Phipson, Green bestrides the landscape of church Victorianisation in East Anglia. The bodies of their work are considerable, and it wasn't just their own plans; anyone else's work would also have to cross their desks for them to cast a cold eye upon it. Their enthusiasms were as different from each others as it is possible to be, I suppose. Phipson was a technician, with an eye for detail. In restorations, his innovations blend fairly seamlessly into the medieval, which sounds good, but often leaves a rather dour, characterless atmosphere. Sometimes he went mad, producing extraordinary spires on a couple of churches in the Stowmarket area, and he could be very impressive on a grand scale, such as the complete rebuilding of St Mary le Tower in Ipswich. Herbert Green, on the other hand, was a Victorian first and an medievalist second. Sometimes it is hard to see the medieval origins at all behind his rebuildings, scourings and facades. 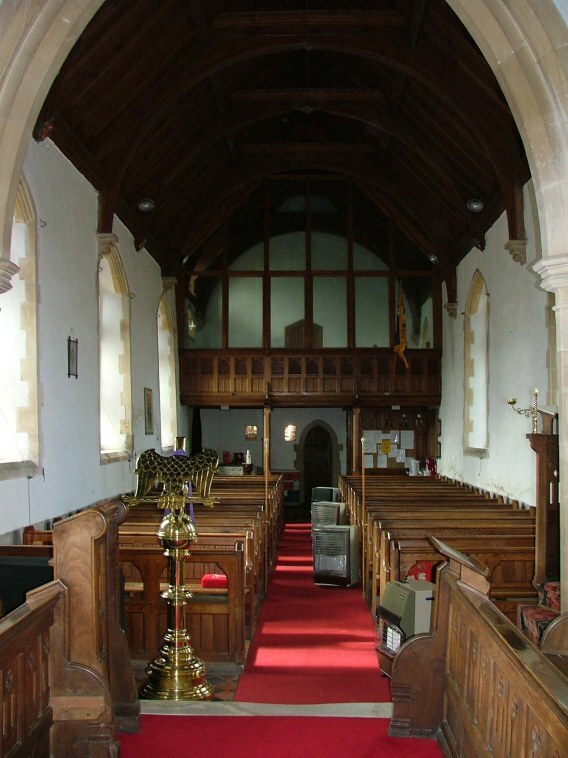 Here at Burgh, he built a 'Perpendicular' nave and a 'Decorated' chancel and tower, which is of course exactly the relationship you find at so many rural medieval churches in East Anglia. 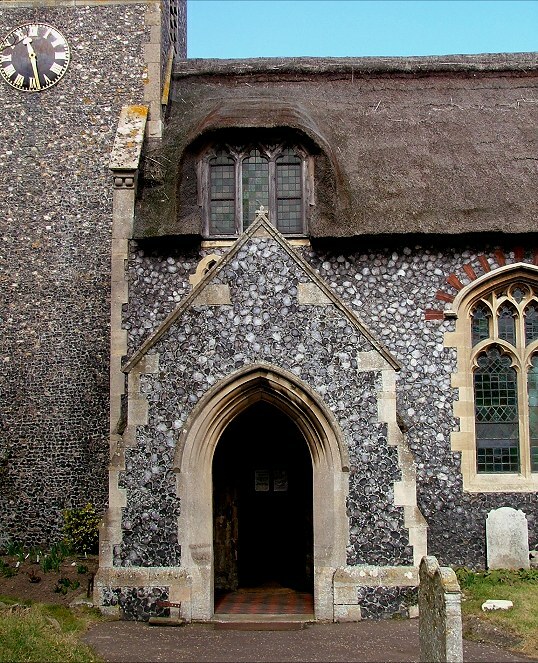 It's just that here it isn't real - to all intents and purposes, this is a faux medieval Norfolk parish church. 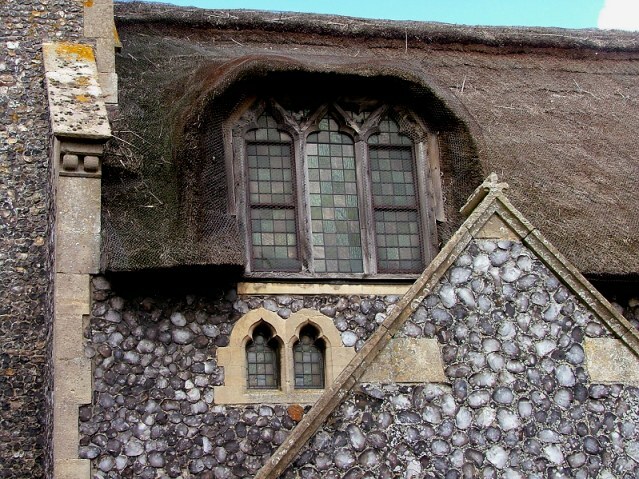 The harsh blue knapped flints would look even worse if it wasn't for the thatching that softens them. 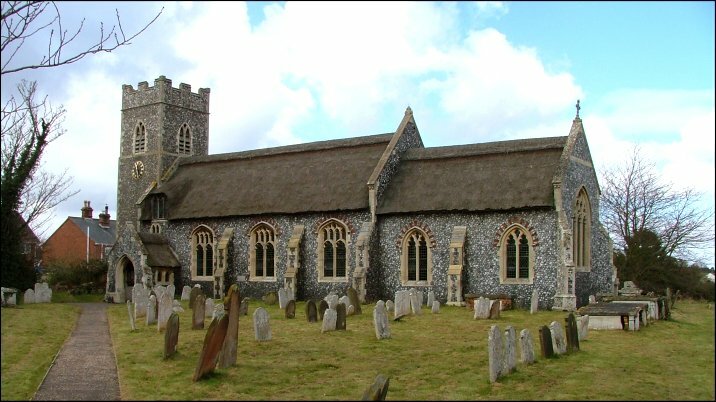 One curiosity - note how high the gables at the east end of the nave and chancel rise above the thatch. That on the nave is even higher than the bell windows of the tower. This must be because they are substantially the medieval originals. But nothing else is, I think. The red-brick arching to the windows helps a bit, but really this is a severe exterior, and knapped flint on such a scale would soon fall out of fashion, to be replaced by the cosiness of the Arts and Crafts movement. We can already see this happening here, for there is a cottage dormer window above the porch to be thankful for. It is here for a reason, because it lights the little gallery tucked into the roof space. Inside, everything is Herbert Green's, pretty much. There is no tower arch, just a doorway, through which you can access the gallery. 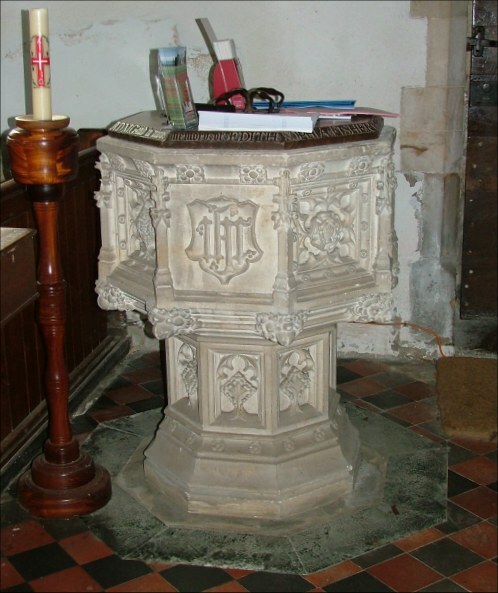 The furnishings are all of a piece, and the font is in the style of the 15th century. 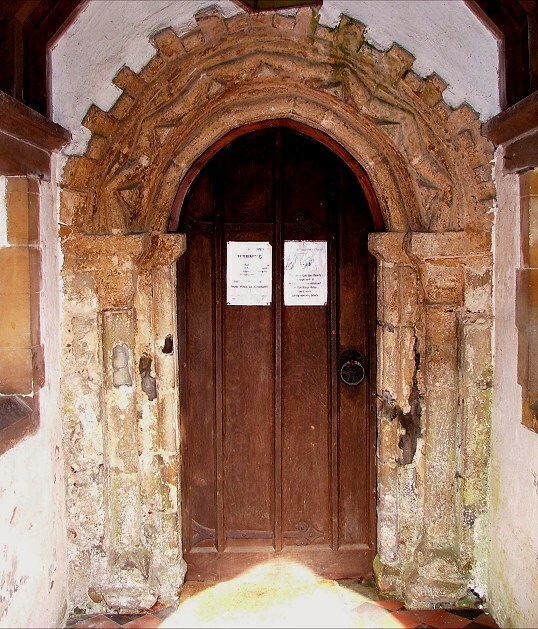 Green was very fond of Norman fonts, so it is interesting that here he chose a font to match the (imitation) Perpendicular nave rather than the (real) Norman south doorway. 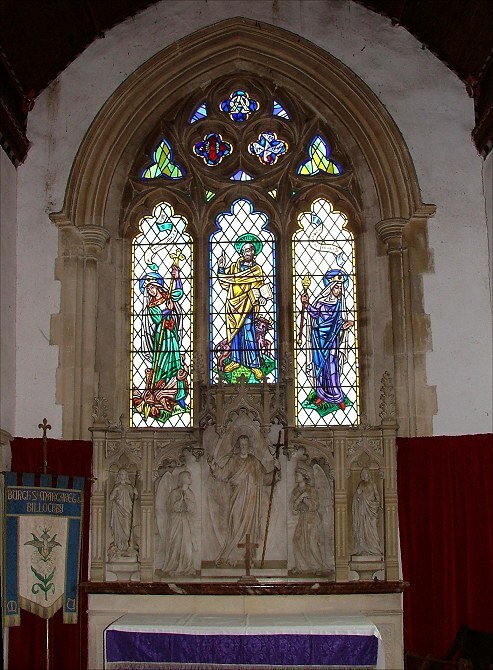 The stone reredos is perhaps more in Green's heavy style. There are a couple of items of interest. 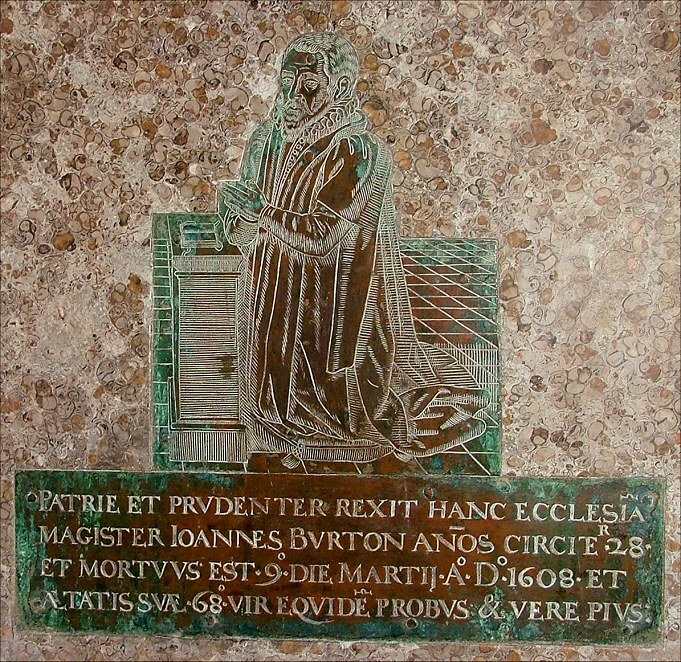 A figure brass of 1608 remembers Richard Burton, the minister of this parish; it is remounted in a marble setting on the chancel wall. Opposite it is a moving memorial to George Thompson Fisher, who died in WWI. He was son of the Rector here who had overseen Green's rebuilding, and who was, incidentally, the very last Bishop of Ipswich. 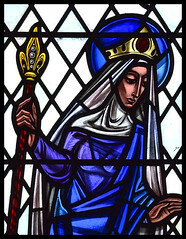 The jewel in the crown of all this is the east window of 1968 by Paul Jefferies, in the uninhibited dynamic style of the time. 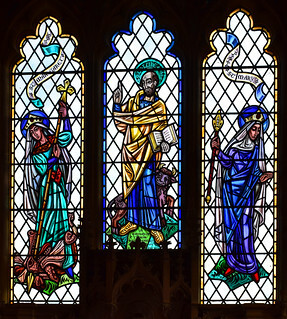 It features the figures of St Margaret, St Luke and the Blessed Virgin. 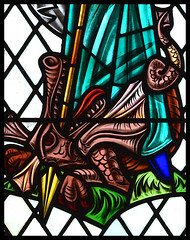 St Luke's bull looks a cheery sort, and St Margaret dispatches her dragon with aplomb. 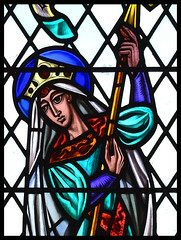 Mary, who is shown as the Queen of Heaven, is a little less vigorous than the other two figures. 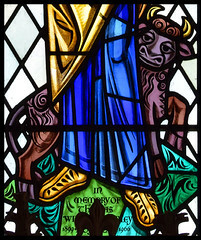 Her lack of an accompanying animal throws the composition slightly out of balance, and you wonder why she wasn't placed in the central light.